Again and again, I find it so difficult to try describing what makes a garden great, never mind actually pin-pointing specific attributes. It’s not that I’m trying to categorize all gardens into good or bad, but when you walk into a beautiful garden, it’s instinctual to ask what makes it so. Of course there’s no formula for beauty, but there are ingredients. What I mean to say with that lengthy prologue is that Les Jardins de Castillon-Plantbessin is a great garden, but it’s difficult to describe what sets it apart from a merely good one. The history of the gardens at Castillon is not too different from many others: husband and wife team (Colette and Hubert Sainte-Beuve) start nursery, become completely obsessed by it, and create superlative garden. 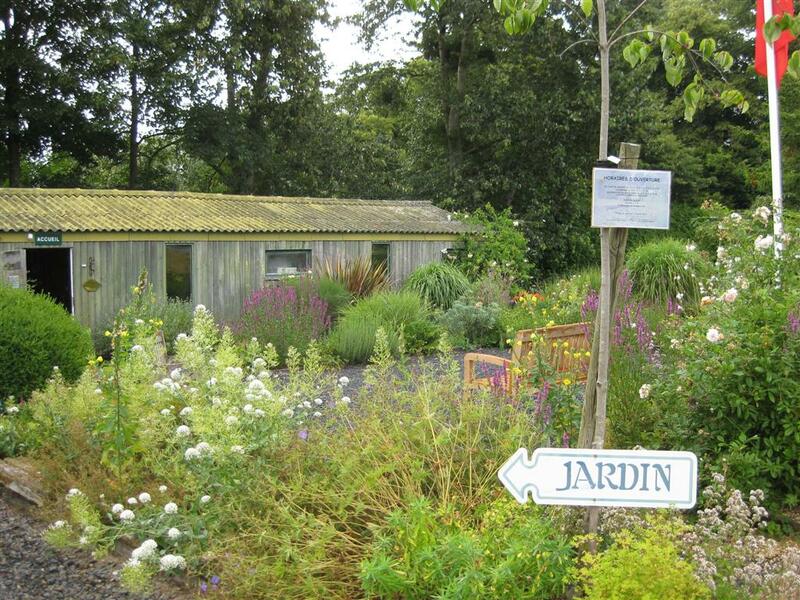 The first garden at Castillon was created in 1985, conceived and implemented entirely by the owners. 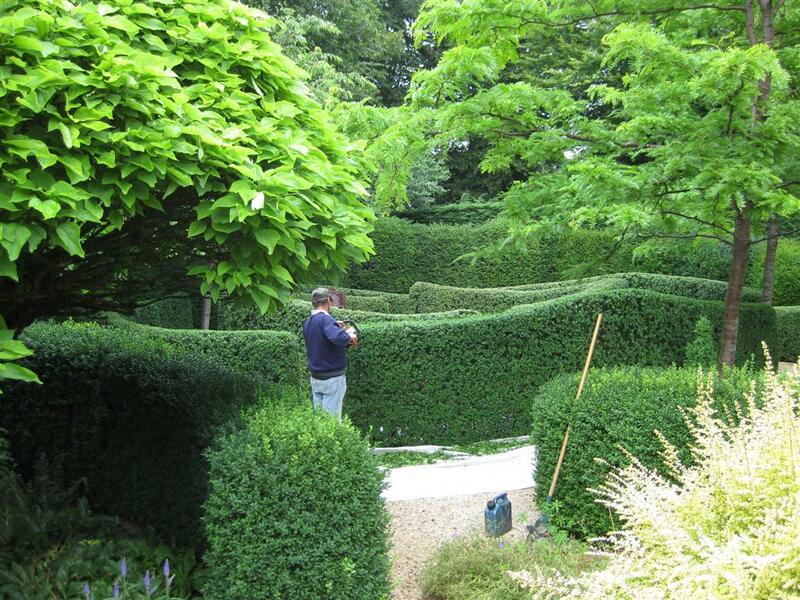 The second garden is a more recent addition and was designed with the help of artist François Houtin. 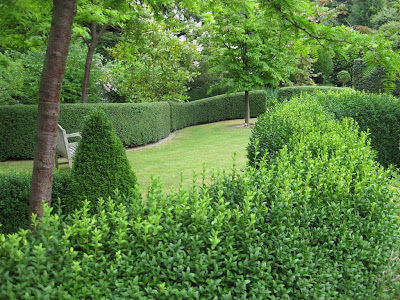 The two gardens, old and new, are similar in size, two rectangles that approximately mirror each other on either side of a wide central path. The plan that the owners started with for the first garden sounds like a sure recipe for disaster. The concept was a series of themed garden rooms covering almost all garden styles known to man, from the quintessential English double border to minimalist Zen. Sounds like a case of falling in love with plants and gardens, and wanting to have a little bit of everything. But even I know that this cannot possibly succeed – it’s a mish-mash, it muddles the message and it’s nearly impossible to create a coherent picture with a sense of place (although it's still possible to have many impossibly pretty vignettes). Doesn’t sound too great up to now, does it? Well, that’s where the second garden comes in. This garden somehow manages to pull the whole thing together into one cohesive, memorable experience. I have a few theories (3 to be exact) as to why it works: it guides your journey, the design is in harmony with the older garden, and it has a clear focus which draws out the best qualities of the old garden and the place itself. How you are led through a garden is so important – it guides your mind and defines how you experience the space. At Castillon, according to the prescribed visit plan, you start with the new garden and proceed through it entirely before crossing the central path over to the older section. 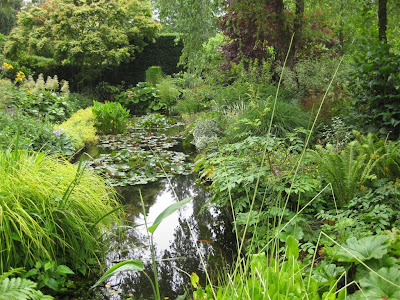 Once in the older section, you start with the water garden first (which I gushed about previously), which is the most stunning garden in the original area, and the one that clearly links to the new garden. 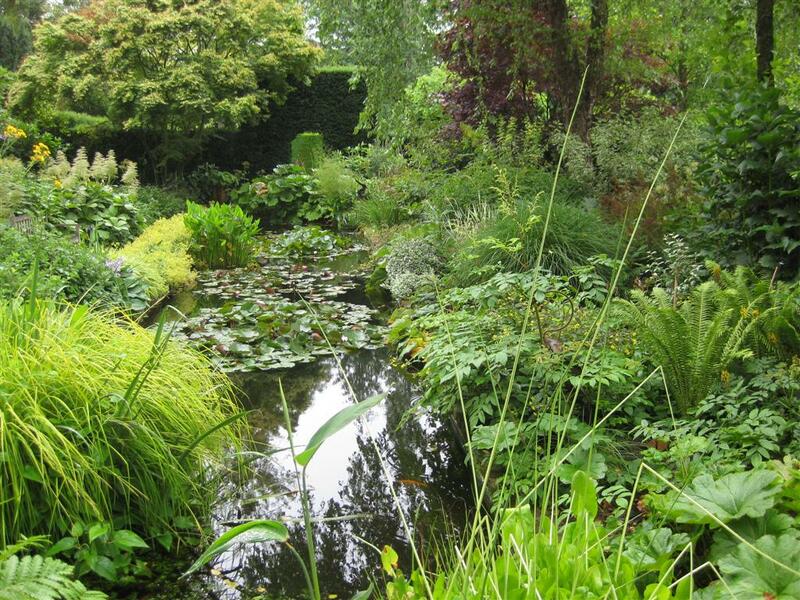 I suspect that the theme of this particular garden (water combined with a rich plant palette based mainly on greens and textures) served as the key inspiration for the new garden. So, after a great first half and a fantastic transition into the second half, by the time you get to the more so-so sections of the old garden, you are already so enchanted you hardly notice. To keep the design consistent, the layout of the new garden also uses garden rooms. However, the divisions are very simple – the long rectangular space is divided into 3, square-ish rooms. Straightforward paths take you around each room, and a central opening is used to transition between spaces. I've recently read criticism about gardens designed as rooms, because the constant shifts don't allow for a single experience, a feeling to develop. I’m in the same camp, but I think it works here because the rooms don’t actually offer completely different experiences, just sequential illustrations of the same theme. The divisions could easily be taken down and a cohesive whole would result. Also, the ‘room’ concept was used here to link with the design of the older garden, and works well to achieve a unified overall picture. Lastly, we come to the actual content of the new garden, the best part. We visited on a rainy, gray morning in July. Water seemed to be everywhere – in the heavy, grey clouds above, trickling down our rain jackets, and glistening on every plant and path. Given the watery mood, which is more or less typical of Normandy, the many ponds and fountains in the gardens seemed like a perfect fit. The dark water and wet stone provided the needed contrast to the lush plantings – layers of textures and shades of green sparkling with water beads, and both water and the plant palette seemed to capture the general mood of the place. Since that blurb was a bit all over the place, I saved the pictures for last to show the journey through the garden as experienced first-hand (captions below the pictures). The central path where you enter the garden from the parking lot. 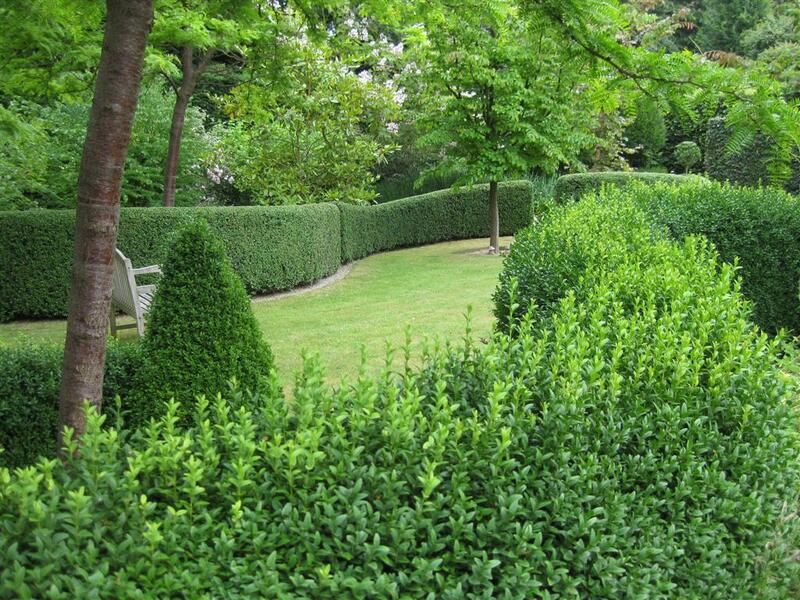 The tall hedges on either side guard the secrets of the two gardens, new (right) and old (left). 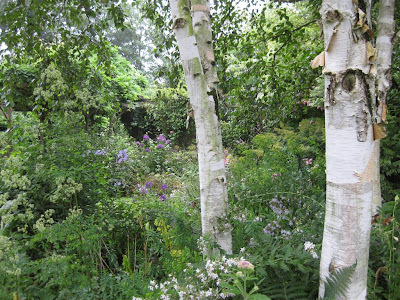 The first space in the new garden is all foliage and structure, soft and strong at the same time. It beckons you downwards and onwards through the gardens. The transition between the first and second garden room. Stepping stones across the pond guide you onwards. From water and lushness, to a more subdued, open lawn. After crossing the central path, you are plunged back into water and impossible lushness. Phew - overdrive of senses somewhat relieved by more traditional borders and lawn of the old garden. Castillon is a garden I keep thinking about, images of it popping up in my head randomly when I’m daydreaming. Only a few weeks ago, I was anticipating the arrival of a harsh winter in Belgium based on the unlikely discovery of a few speckles of snow in early December. We didn’t have to wait long because only a few days after that post, it started snowing... to the tune of Belgian’s harshest winter since 1946. But almost as suddenly as it came, Belgian's big winter has vanished. We came back on Thursday from holidays in Canada to discover that the almost 2 feet of snow which we left behind has dissolved into puddles and muddy fields, and temperatures are now at a balmy 10C. Winter may have been short, but it was beautiful. Here are a few pictures of the magical winter landscape not often seen in Belgium, taken on December 18th. The snow had that perfect quality which makes it stick to every surface. It’s amazing how much we can overlook when admiring nature and our gardens – only with snow highlighting every twig, can one fully appreciate the intricate branching structure of trees and the rich woody layers of the forest. A snowy cover also means that we're irresistibly attracted to any colour not white or brown. Pictures of red berries in winter are so overdone, and yet it's hard not to take (and post) just one more. Structure and colour - winter is a great reminder of these important elements of landscape.